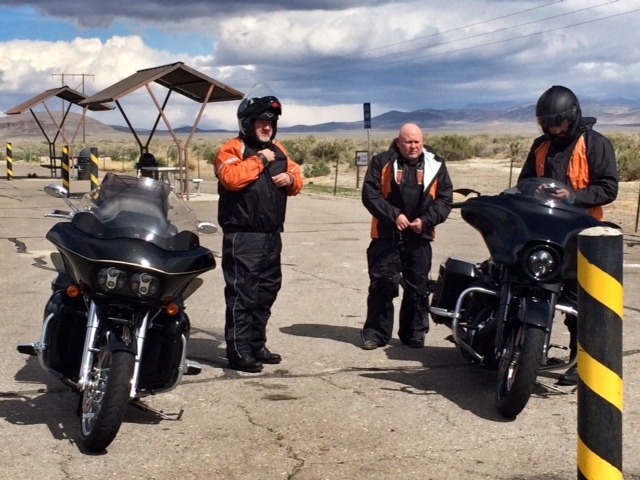 No blog post can touch on the full spectrum of a trip, but I’ve put together some snippets of what our “off-season” ride looked like heading to Laughlin River Run in April. You might say we got a sense of the diverse charms that spring weather in Oregon provides by starting in Portland and tracing a route up the slopes of Mount Hood and then south toward Bend then east to Burns. Can anyone say weather woes? There was wind, rain, heavy thunderstorms, hail, lighting BOOM! and all of this during the first 5 hours of the trip! By no means am I complaining, but even with all the technology to expand our knowledge about weather patterns and conditions sooner or later, you’ll have to ride in the rain… and did we ever. After the 5-hour trip to Burns we are now certified wet-weather professionals! By the time these cold and weary travelers stopped in Burns we were done with the wind-chill riding. This part of the trip was like a steeled-toed kick into springs teeth! Winter reigned. As a side bar, have you ever noticed the difficulty of heated gear and in routing the cables and making the connections? I typically avoid “plugging-in” until it’s very cold and raining. The extra rain gear and winter clothing is bulky and then we’re trying to route these COAX 2.5mm connectors through the sleeves into a SAE 2-pin connector and somewhere in the mix is either an on/off switch or a single controller that allows you to control the vest or any other item connected to the vest (gloves, pants, socks) as one single zone. This rarely works well when there are multiple heated garments because they develop hot spots and I’ve had a vest get too hot while the gloves were cool and those dual electronic controller units for two separate zones mean even more wires and more expense. Yeah, it all looks easy enough sitting in the motel room, but the reality is it takes coordination to get it all on, position it correctly so that you have freedom to move and then it’s a “do-over” after a fuel or rest stop. It should be easier? At any rate, the next morning we grabbed a sausage biscuit, put on rain gear, “plugged-in” and rode out early from Burns toward French Glen. We took the French Glen Highway (or Oregon Route 205) to avoid the worst of the rainy weather. Part of the group was headed directly to Las Vegas (700+ miles) and wanted to put some major miles on vs. the remainder of the group planned a more leisurely ride down to Laughlin with a day or so in Death Valley. Ammunition Depot at “America’s Patriotic Home” — Hawthorne, Nevada. 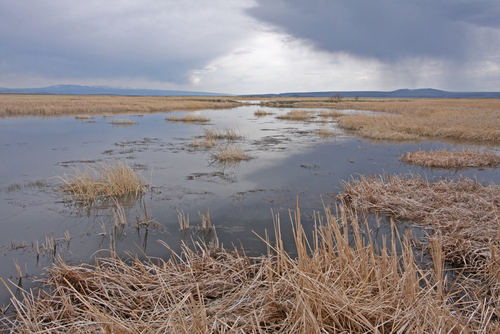 We headed east then turned south on Oregon Route 205 through the Malheur National Wildlife Refuge where the summers are short and it’s home to countless migratory birds. Despite the seeming nakedness of the landscape on most of the route, this area of Southeastern Oregon which OR-205 travels through is a true wonderland of high desert topography. There are no less than four designated scenic byways that take off from OR-205, or is the route itself. 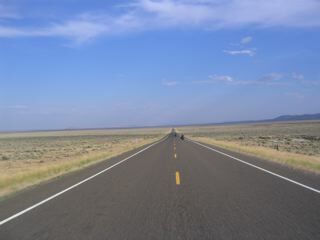 From a motorcycling perspective, the road isn’t all that challenging and like many little used desert highways in Oregon, the actual road surface is in good condition for the entire route. For a majority of the ride, the road is straight with a few long bends that, fortunately, change your perspective of the wide open landscape occasionally. I’d like to tell you all about the photographic panoramas and the many intriguing natural geologic pictures I took in the spectacular mountain range, but there was heavy fog, mixed with thunderstorms and for a couple hours outside of French Glen we even rode in full on snow flurries. And I’m not talking about a blizzard of Snow Geese mind you, but traversing the area in blinding snow. We did see the French Glen “Historic” telephone booth! This trip didn’t offer us the time to ride Steens Mountain loop road, or continue over the summit ridge and onto the Alvord Desert. We did the math. We double checked weather radar and this was the quickest and the logical adverse weather avoidance route. We hoped to avoid much of it, but the storm and high winds engulfed the entire state. As we motored on my mind wondered if this was how the settlers and fortune-seekers who made their way West through gorges and high-mountain lakes had to deal with during their overland route. By the time we hit the Winnemucca stopover point, the weather was beginning to improve. At least the snow and rain had stopped. Winnemucca is a gateway of sorts to the Great Basin, with Idaho and Oregon to the north, Salt Lake City to the east and Reno to the southwest. It’s located at the crossroads of Interstate 80 and U.S. Highway 95. We did notice that a strong wind was blowing out of the south. This was high-wind warnings and there were a lot of semi’s pulled over to the side of the road waiting it out. After a lot of miles I became convinced that the great state of Nevada had the sole purpose of being an ATV enthusiast’s playground. Of course, this isn’t 100 percent accurate, but as you ride along the desolate roads it might as well be. The sand in the air blew into our faces, covering us with a fine layer as we rolled on the throttle and continued south down Highway 95. 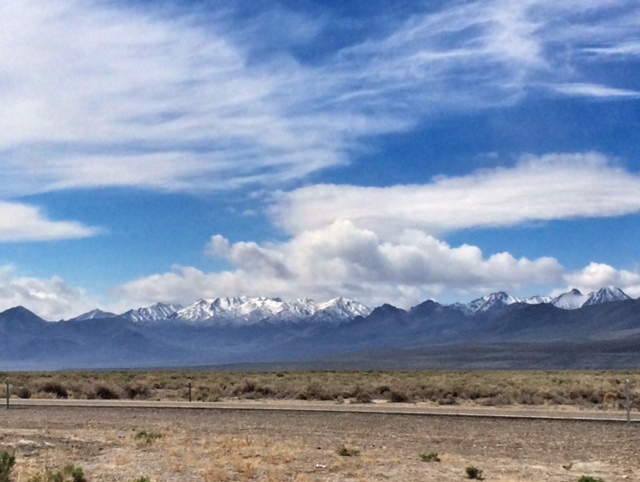 The group I was riding in overnighted in “America’s Patriotic Home” — Hawthorne, Nevada. The town is unique with Walker Lake at the foot of Mt. Grant, but more importantly there is the Naval Undersea Warfare Center and the Ammunition Depot in the area. At first glance that is incongruous since it’s in high desert east of the Sierra Nevada and at least 300 miles from the nearest ocean. The Army stores some nasty stuff at what started out life as the Hawthorne Naval Ammunition Depot (NAD). The facility is made up of hundreds of buildings spread over more than 225 square miles and bunkers dot the sagebrush-covered hills which are visible from the highway. Sadly, back in March 2013 a mortar shell explosion killed 7 marines and injured eight during mountain warfare training in the area. We overnighted in Hawthorne which is shouldering its share of the economic slump as there are empty storefronts with windows neatly covered with plywood painted white, red and blue stars. We found a Mexican restaurant called Diego’s which was within walking distance of the motel and after a 425 mile day enjoyed some refreshments and good food. 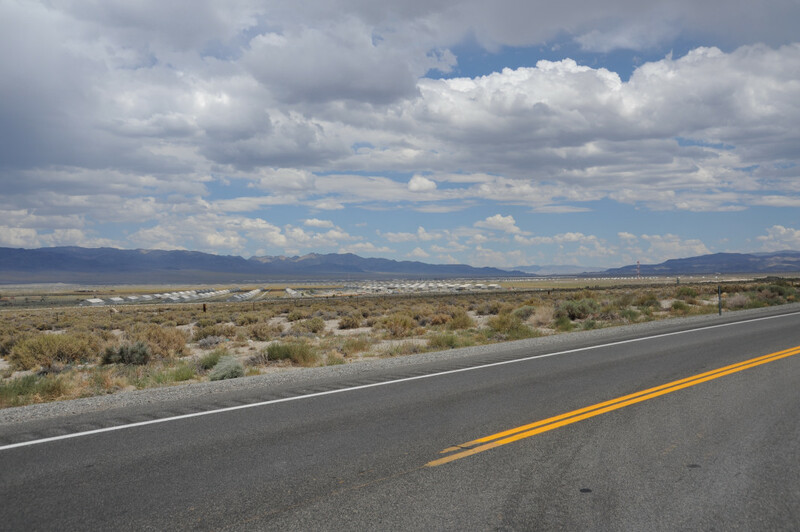 We were headed to Death Valley via the eastern entrance at Beatty and planned to stay over at Stovepipe Wells and ride around the valley floor for a day. 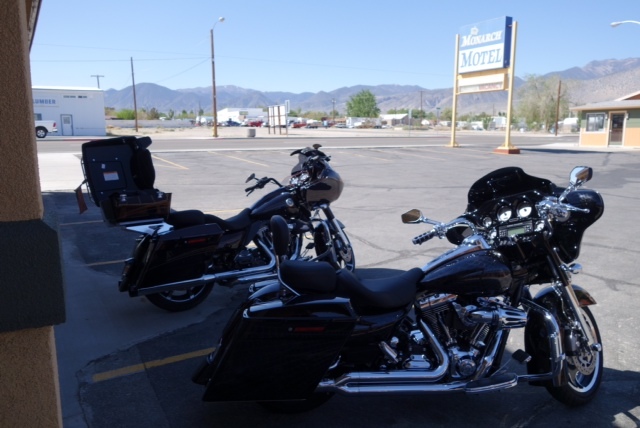 The Ride To Laughlin 2014 – Part 2 (HERE). It’s not every day that you can ride into history, but on Monday, June 30, 2008 you can become a part of something very different. Harley Owners Group (H.O.G.) members around the world will band together in a singular challenge, to log a cumulative one million riding miles by the end of that day. Whether you ride around the neighborhood or all day, solo or as part of a larger group and wherever you ride in the world, HOG members participating in the Million Mile Monday ride will make club history. HOG hopes to make this an annual event and is open to all HOG members– riders or passengers. This historical event will be recorded when HOG members log into the club’s website, where you can register miles ridden that day. You can get more information at HOG. The above photo was taken a couple years ago during a trip to Steens Mountain. 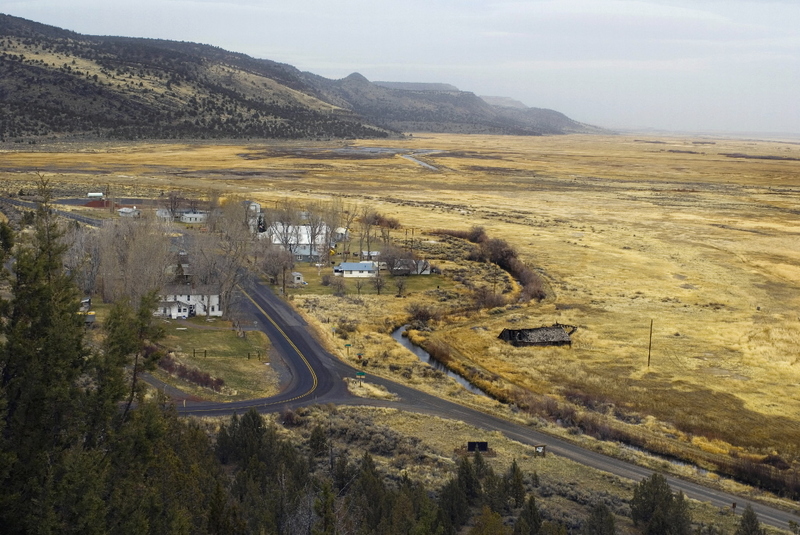 The Steens Mountain Loop is part of the scenic back country byways and about 60 miles south of Burns, OR. You can see forever down the Alvord Desert Basin and it felt like a million riding miles when the August air heats up!